Revolution Slider Error: Slider with alias aboutus not found. Bushy started a charity organisation called, OUT ON A LIMB. His first feat was to raise awareness and funding for the charities he supports and gives other disabled people, motivation to get on with there lives. And embarked on a scooter trip around South Africa to meet with heads of state and other charities to see how they succeed or fail. There after a road trip from his home town Pietermaritzburg into Lesotho on a delivery motorcycle to the roof of Africa and back, Went around Southern Africa(South Africa ,Namibia and Botswana)on a documented motorcycle journey . His next challenge is to get the world record for the longest distance on a motorcycle by an individual in twenty four hours, which currently is 3249.9 KM. This is to raise funds for a prosthesis for a lady that has lost her leg above the knee. 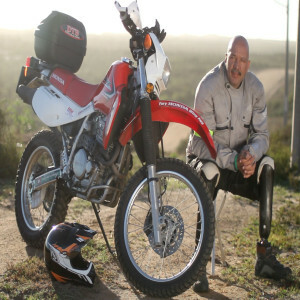 Thereafter his next challenge would be a documented ride on a motorcycle from Durban, South Africa to the Isle of Man in April 2014 as well as to partake in the famous TT……..